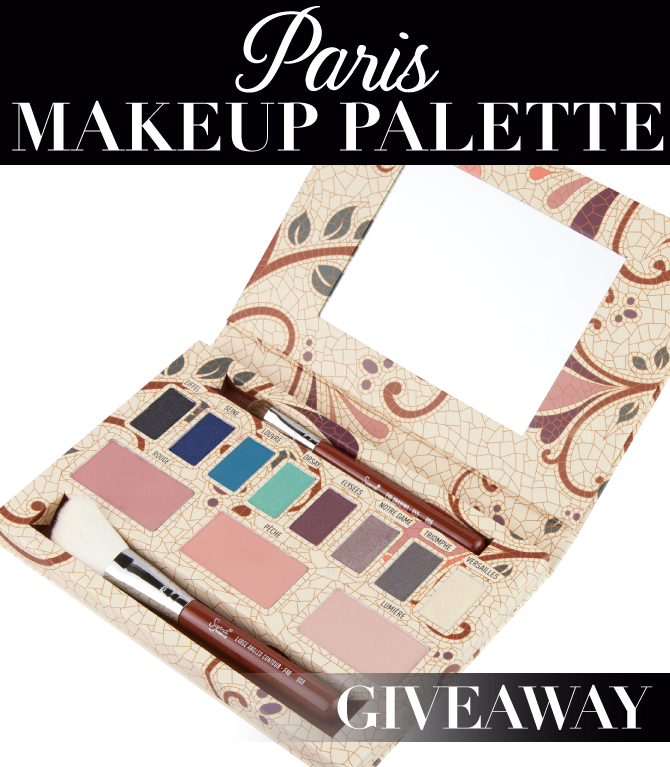 We've decided to give the new limited edition Paris Palette to one lucky winner! The Paris Palette includes eight eye shadow colors inspired by landmark monuments and locations in Paris. It also includes two blush colors and one highlight shade, carefully developed to complement all skin tones. The palette comes with two essential brushes for a flawless makeup application. To enter, simply fill out the form below with your name, e-mail address, website (if applicable), and tell us what your favorite shade from the palette is! The winner will be randomly selected and announce some time next week! Good luck, gorgeous! Thanks for doing this giveaway!! I've been eyeing this palette since it came out, but I can't afford it. I'm a college student and I would LOVE to own just one Sigma product!! I've heard they are amazing, but I've been unable to get anything because of financial issues. Thanks!!! let c my luck but thank u for this chance.. Entered! I hope I win. I would love to try this palette! Awesome giveaway! Thanks so much! Wish i get it!! that palette is absolutely amazing ! how eXciting!!! I love u Sigma! Meu Pai do Céu.... eu quero ganhar demais... amo tudo da Sigma! Love this palette! Swatches are TDF! OMG! Would love to win! I want this so bad but can't afford it. Thanks for the chance! I really wish i get it!! I want this palette so bad .... I hope I win. Thanks for the giveaway! I've been wanting this palette for the longest time! Thanks for openning this giveaway to worldwide!!! OMG I love all things sigma! I would love to win this!!! I hope i win, want to try these shades on my models. Thanks SIGMA!!!! Really would love to win this.... Fingers Crossed!!!! Esta paleta é maravilhosa!!!! Quero muito receber..............ganhar!!!! Really hope I win I never win anything this palette is amazing and I can do so many looks with it on my YouTube beauty channel I would literally die of excitement if I won because you are my number one company I love you sigma for this giveaway fingers crossed!! I need this palette in my life but cant spend any money on cosmetics right now! Thanks so much por this beautiful giveaway!!! Love this palette! would love to win one to try!! Gorgeouse palette inspired by Paris. From Eiffel Tower, Champs Elysees, Notre Dame, Arch de Triomphe to Versailles. Would love to try it out. Difficult to choose a fav color. I'll keep my fingers crossed. Lovely palette!! I want one!!! This haaaaaaas to be mine! I've been drooling over it since I saw Tiffany D's video about it! G-O-R-G-E-O-U-S! It's like a mix of the Bare, Flare and Dare-palettes, only a THOUSAND times better! Excited!! I would live to win and try the amazing colors!! Tiffany D is my Fav!! will be a dream to be drawn. Love the colors. Thanks so much for doing this giveaway! Thank you so much for this giveaway. This palette is gorgeous and all of the colors are beautiful. I am ready to receive my free palette! I want this palette! ;) Finger Crossed! I hope i win.. Today is my Birthday. Super excited, such an awesome colour selection in this palette! Amazing palette!!! thanks for the oportunity kisess from venezuela!!!! AMAZING PALETTE!!! Thanks for the oportunity Kisess from Venezuela!!! That would be a great birthday gift, even a few days late. Love the highlight and the blushese! Fingers crossed! I hope I win. I need sigma eyeshadows. I love sigma products....just bought mr. bunny! I hope win! I would really love to win the sigma. I have never won makeup before. I LOOOOOVE IT!! HOPE I WIN!!! MEXICO WILL LOVE THOSE SHADES!! hopefully I can have this palette. Great post!!! (and giveaway) I really wanna try te bunny brushes!!! Fingers crossed! I need some luck my way! Thank you Sigma for this chance! My fingers are crossed all the way! Me encanta la paleta! Muchas gracias por este sorteo! is it for the affiliates only? i hope i win!! this is a really cool palette! Thank you for this giveaway!!! The palette is awesome! I'd like to get acquanted closer with Sigma! Wish I get it!!!!!! 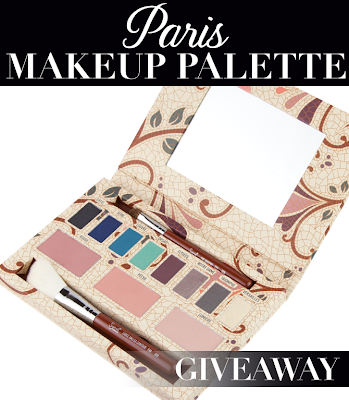 I can only dream at Paris palette :(( My only chance it's a giveaway as I don't think I can afford it, but it's lovely! this palette is so glamour! Amazing palette. All the colors are so wearable and beautiful. I would love to have the chance to try it. Thanks so much for this great opportunity. Good luck to everyone! This Palette is.... Gorgeous!!!! I would love to try this palette. Thank You!! Love to try this palette. Luck for everyone!! entered! whoo!!! I really hope I win!!! Verry cute palette. I whould like to try it..
Omg, beautiful palette! Love it! I want to win! Shades are all so gorgeous !!! Omg gotta have it! Looks great. Merci de nous offrir cette opportunité!!! ¡¡Gracias por ofrecernos ésta oportunidad!!! Gràcies per oferir-nos aquesta oportunitat de guanyar la paleta Paris!!!! I really want to win the Paris Palette. I found it very beautiful, and it is my dream of consumption. I really want to win! Nice give away! Thanks for the giveaway... I would be really happy to get this palette! Quero muitooooooooo! Esta paleta é igual a que Camila Coelho usa em seus vídeos. Thanks for the giveaway! Muaaakss! I want it so much!!! What an amazing giveaway! Good luck to everyone that enters : ) Sigma is an amazing company. Sigma Simplesmente uma marca de altissima qualidade, nao so por atender as ezigencias das mulheres, mas por obter um dos melhores expecialistas em cosmeticos... bom eu adoraria ganhar algum produtos da sigma por que eles sao perfeitos e acho que eu mereço por que seria um otimo presente de aniversario que sera 24/06 e vou ficar de dedos crusados... pois seria o melhor presente que eu ganharia... apesar de que todas as meninas tanbem seriam merecedoras por que todas as mulheres sao merecedoras de ganhar um produto da sigma . Wir haben bereits mehrere Videos zur Palette gesehen - wirklich sehr gut gelungen! QUERO MUITO GANHAR ESSE SONHO DE PALETA. This palette is just gorgeous!!! Thanks Sigma for this giveaway! Come To Brazil Paris Makeup Palette! Gorgeous palette! Thank you for this giveaway :) hoping to win this awesome awesome palette :p More power to Sigma! Wow, It has so many pretty colors in this palette. I wish I could get my hands into this. Wish us luck! Thanks for the amazing giveaway1 Thanks again Sigma..
Meu Deus te peço em nome de Jesus que essa paleta seja minha, pois a desejo muito e creio na sua palavra que diz que o Senhor satisfará o desejo de meu coração. Amém. Oh my! I want this sooooooooooooooo bad! OMG! me gustan todos! Gracias Sigma. Such a generous giveaway! Sigma Beauty makes my FAVORITE brushes & cosmetics so it would be a dream come true to win! LIKE on Facebook and Tweeting on Twitter!